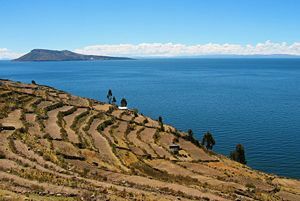 Lake Titicaca is the highest commercially navigable lake in the world, at 12,507 feet (3,812 m) above sea level, and the largest freshwater lake in South America. Located in the Altiplano (high plains) in the Andes on the border of Peru and Bolivia, Titicaca has an average depth of 107 m, and a maximum depth of 281 m. The western part of the lake belongs to the Puno Region of Peru, and the eastern side is located in the Bolivian La Paz Department. The Bolivian naval force uses the lake to carry out exercises, maintaining an active navy despite being landlocked. The lake is composed of two nearly separate sub-basins that are connected by the Strait of Tiquina, which is 800 m across at the narrowest point. The larger sub-basin, Lago Grande (also called Lago Chucuito) has a mean depth of 135m and a maximum depth of 284m. The smaller sub-basin, Lago Huiñaimarca (also called Lago Pequeño) has a mean depth of 9m and a maximum depth of 40m. The partly salt Lake Maracaibo in Venezuela is the only body of water in South America bigger than Titicaca, at about 13,000 square kilometers, but some say it should be classified as a sea because it is connected to the ocean. 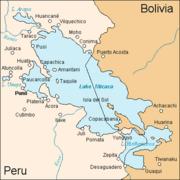 The origin of the name Titicaca is unknown. It has been translated as "Rock Puma," allegedly because of its resemblance to the shape of a puma hunting a rabbit, combining words from the local languages Quechua and Aymara. It has also been translated as "Crag of Lead." In 1862 the first steamer to ply the lake was prefabricated in England and carried in pieces on muleback up to the lake. Today vessels make regular crossings from Puno, on the Peruvian shore, to the small Bolivian port of Guaqui, where a railroad connects it with La Paz, capital of Bolivia. The world's second-highest railroad runs from Puno down to the Pacific, creating an important link with the sea for landlocked Bolivia. More than 25 rivers empty into Titicaca, and the lake has 41 islands, some of which are densely populated. 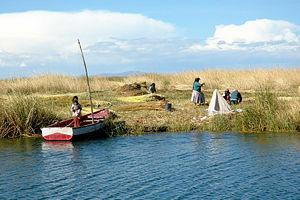 Titicaca is fed by rainfall and meltwater from glaciers on the sierras that abut the Altiplano. One small river, the Desaguadero, drains the lake at its southern end and flows south through Bolivia to Lake Poopó. This single outlet empties only five percent of the lake's excess water; the rest is lost by evaporation under the fierce sun and strong winds of the dry Altiplano. Titicaca's level fluctuates seasonally and over a cycle of years. During the rainy season (December to March) the level of the lake rises, receding during the dry winter months. 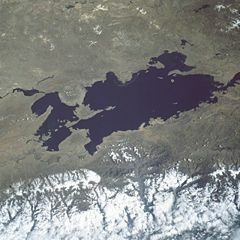 It was formerly believed that Titicaca was slowly drying up, but modern studies have seemed to refute this, indicating a more or less regular cycle of rise and fall. Titicaca's waters are limpid and only slightly brackish, with salinity ranging from 5.2 to 5.5 parts per 1,000. Surface temperatures average 56º F (14º C); from a thermocline at 66 feet (20 m) temperatures drop to 52º F (11º C) at the bottom. Analyses show measurable quantities of sodium chloride, sodium sulfate, calcium sulfate, and magnesium sulfate in the water. Lake Titicaca's fish consist principally of two species of killifish (Orestias) – a small fish, usually striped or barred with black, and a catfish (Trichomycterus). In 1939 and subsequently, trout were introduced into Titicaca. A large frog (Telmatobius), which may reach a length of nearly a foot, inhabits the shallower regions of the lake. 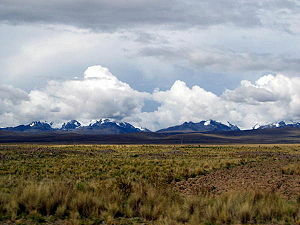 The Altiplano (Spanish for high plain), where the Andes are at their widest, is the most extensive area of high plateau on earth outside of Tibet. At the end of the Pleistocene epoch, the whole extent of the Altiplano was covered by a vast lake, Ballivián, the present remnants of which are Lakes Titicaca and Poopó, the latter a saline lake extending south of Oruro, Bolivia. Salar de Uyuni and Salar de Coipasa are two large dry salt flats also formed after the Altiplano paleolakes dried out. The climate of the Altiplano is cool and semi-arid to arid, with mean annual temperatures that vary from 3 degrees C near the western mountain range to 12 degrees C near Lake Titicaca. Total annual rainfall is more than 800 mm near and over Lake Titicaca. 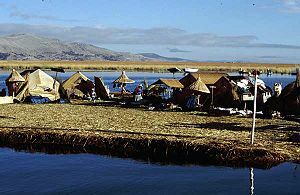 Titicaca is notable for a population of people who live on the Uros, a group of about 43 artificial islands made of floating reeds. Their original purpose was defensive, and they could be moved if a threat arose. One of the islands retains a watchtower largely constructed of reeds. These islands have become a major tourist attraction, drawing excursions from the lakeside city of Puno. Uros is also the name of the pre-Incan people who lived on the islands. Around 3,000 descendants of the Uros are alive today, although only a few hundred still live on and maintain the islands; most have moved to the mainland. The Uros traded with the Aymara tribe on the mainland, interbreeding with them and eventually abandoning the Uro language for that of the Aymara. About 500 years ago they lost their original language. When this pre-Incan civilization was conquered by the Incas, they were forced to pay taxes to them, and often were made slaves. The islets are made of totora reeds, which grow in the lake. The dense roots that the plants develop support the islands. They are anchored with ropes attached to sticks driven into the bottom of the lake. The reeds at the bottoms of the islands rot away fairly quickly, so new reeds are added to the top constantly. This is especially important in the rainy season when the reeds decompose much faster. The islands last about 30 years. Much of the Uros' diet and medicine also revolve around these reeds. When a reed is pulled, the white bottom is often eaten for iodine, which prevents goiter. Just as the Andean people rely on the coca leaf for relief from a harsh climate and hunger, the Uros people rely on the totora reeds. They wrap the reed around a place where they feel pain and also make a reed flower tea. Larger islands house about ten families, while smaller ones, only about 30 meters wide, house only two or three. There are about two or three children per family. Early schooling is done on several islands, including a traditional school and a school run by a Christian church. Older children and university students attend school on the mainland, often in nearby Puno. The residents fish in the lake. They also hunt birds such as gulls, ducks, and flamingos and graze their cattle on the islets. They run craft stalls aimed at the numerous tourists who land on ten of the islands each year. They barter totora reeds on the mainland in Puno to get products they need like quinoa or other foods. Food is cooked with fires placed on piles of stones. The Uros do not reject modern technology: some boats have motors, some houses have solar panels to run appliances such as televisions, and the main island is home to an Uros-run FM radio station, which plays music for several hours a day. 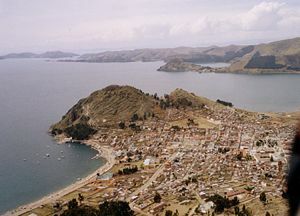 Amantaní is another small island in Lake Titicaca, this one populated by Quechua speakers. About eight hundred families live in six villages on the basically circular 15-square-kilometer island. There are two mountain peaks, called Pachatata (Father Earth) and Pachamama (Mother Earth), and ancient ruins on the top of both peaks. The hillsides that rise up from the lake are terraced and planted with wheat, potatoes, and vegetables. Most of the small fields are worked by hand. Long stone fences divide the fields, and cattle, sheep, and alpacas graze on the hillsides. There are no cars on the island, and no hotels. A few small stores sell basic goods, and there is a health clinic and school. Electricity is produced by a generator and limited to a couple of hours each day. Some of the families on Amantaní open their homes to tourists for overnight stays and provide cooked meals. Guests typically bring food staples (cooking oil, rice, sugar) as a gift or school supplies for the children. The islanders hold nightly traditional dance shows for the tourists and offer to dress them up in their traditional clothes so they can participate. Situated on the Bolivian side of the lake with regular boat links to the Bolivian town of Copacabana, Isla del Sol ("Island of the Sun") is one of the lake's largest islands. In Inca mythology it figured as the place of their origin, and several important Inca ruins exist on the island. Its economy is mainly driven by tourism revenues, but subsistence farming and fishing are widely practiced. Excavations at the archaeological site of Ch'uxuqulla, located on a small peak, led to the recovery of Archaic Preceramic remains that radiocarbon dated to about 2200 B.C.E.. Eight obsidian flakes were recovered, and analysis of three flakes revealed they were from the Colca Canyon, providing clear evidence that inhabitants of the island were participating in a wider network of exchange. The Aymara people have existed in the Andes in what is now Bolivia (and, to a lesser extent, Peru) for over 2,000 years, according to some estimates; about 2.3 million live in Bolivia, Peru, northern Chile, and northwestern Argentina. They lived in the region for many centuries before becoming a subject people of the Inca, and later of the Spanish in the sixteenth century. Some scholars, and many Aymara themselves, associate them with the highly advanced civilization centered at Tiwanaku, though due to the lack of written history this cannot be proven conclusively and does not fit with the linguistic evidence. The region where Tiwanaku and the modern Aymara are located, the Altiplano, was conquered by the Incas under Huayna Capac (reign 1483-1523). The architecture for which the Inca are now known is clearly modeled after the Tiwanaku style. Though conquered by the Inca, the Aymara retained some degree of autonomy under the empire. There were a number of ethnic groups that were later to be known as Aymara by the Spanish. Looking at the history of the languages, however, rather than their current distribution, it is clear that Aymara was once spoken much farther north, at least as far north as central Peru, where most Andean linguists feel it is most likely that Aymara originated. In fact, the Inca nobility may themselves originally have been Aymara-speakers who switched to Quechua only shortly before the Inca expansion. For example, the Cuzco area has many Aymara place names, and the so-called secret language of the Incas actually appears to be a form of Aymara. ↑ International Lake Environment Committee Foundation.Data Summary: Lago Titicaca (Lake Titicaca) Retrieved December 19, 2007. ↑ Charles Stanish, Richard L. Burger, Lisa M. Cipolla, Michael D. Glascock and Esteban Quelima. 2002. "Evidence for Early Long-Distance Obsidian Exchange and Watercraft Use from the Southern Lake Titicaca Basin of Bolivia and Peru" in Latin American Antiquity 13(4):444-454. ↑ Ancient Temple found under the waters of Lake Titicaca,August 23, 2000 BBC News. Retrieved February 25, 2008. Stanish, Charles, Richard L. Burger, Lisa M. Cipolla, Michael D. Glascock and Esteban Quelima. 2002. "Evidence for Early Long-Distance Obsidian Exchange and Watercraft Use from the Southern Lake Titicaca Basin of Bolivia and Peru" in Latin American Antiquity 13(4):444-454. Ancient Temple found under the waters of Lake Titicaca BBC News August 23, 2000. This page was last modified on 20 June 2018, at 14:44.